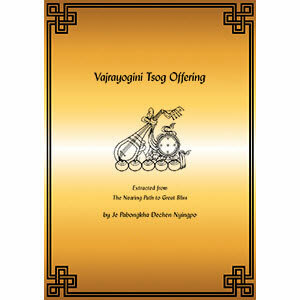 This is the long Vajrayogini tsog offering extracted from the Nearing Path to Bliss: The Uncommon Means of Attainment of Venerable Vajrayogini Naro Khachö, by Je Pabonkha Dechen Nyingpo together with extremely abbreviated tsog offering composed by Lama Zopa Rinpoche. 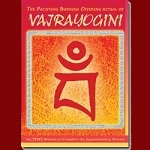 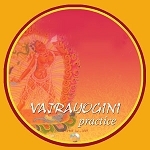 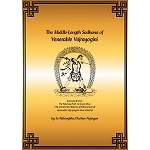 To be used in conjunction with the short, middle-length, or long sadhana practices of Vajrayogini. 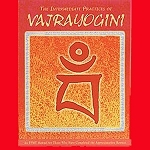 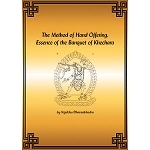 Reformatted to be more user-friendly as a meditation manual, this edition includes Tibetan phonetics and English chantable options in columns on pages opposite to the English translation. 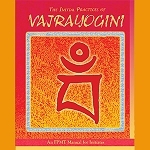 Tunes for the Tibetan and English chantable versions are available for MP3 download on the FPMT Foundation Store.